Day two for this project is in the books. Ever have one of those days where everything was just… on? Where everything seemed to go smoothly for some reason and things just fell into place? Day two was one of those days. I treasure those days. On the first day, I got the sides cut to size and the rebates on all four sides of the bottom. My goal for last night was to get the sliding lid fitted. 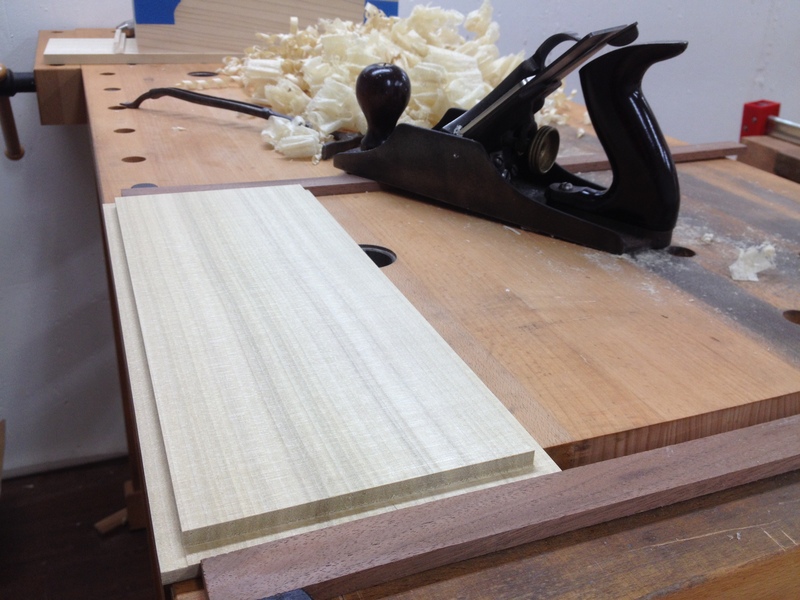 If you hadn’t noticed, I’m just using ½” poplar from the box store. I’m challenging myself here. It’s pretty easy (my opinion, of course) to take really great wood (figured maple or walnut, reclaimed bog oak, something exotic and dense) and make a box that doesn’t look too bad, even if the design is off or the construction is not clean. If you can sand moderately well and not botch the finish, people tend to focus on the wood instead of the form. But I want to take plain wood – just something I picked up from the local home center – and make a really good box out of it. Something that draws just as much attention to it, even though it’s just plain ol’ fuzzy poplar. I buy poplar like I buy pine from the big box stores. Go frequently, dig through the wood, occasionally walk away with a good board or two (but usually empty handed), and stick it in the shop. A few weeks ago, I lucked upon a thin poplar board that was fully quartersawn! Man, it was beautiful and straight as an arrow! I want to find more of THOSE! What do you call a bunny that won’t dance? A square rabbet. 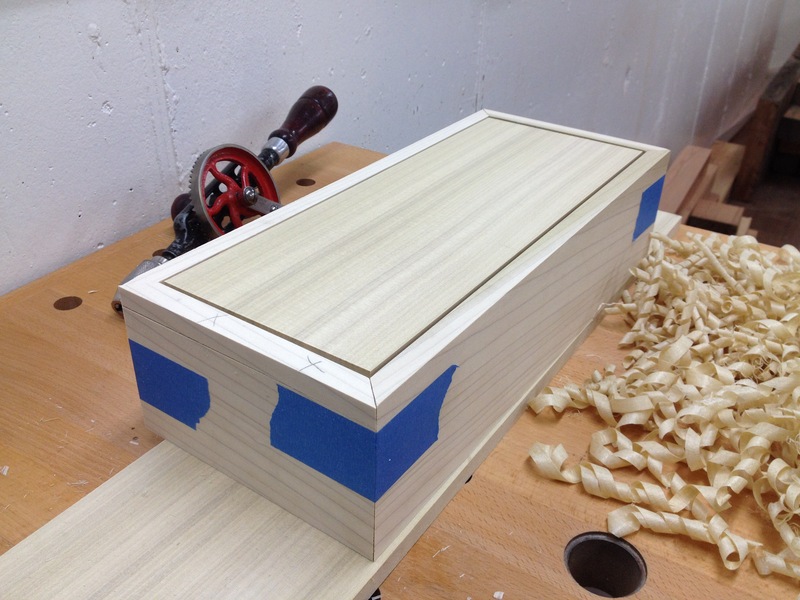 It was the perfect contrast I wanted for the lid, so I pulled it out and cut it to length on the miter box and rebated the edges to make it fit the grooves in the sides. 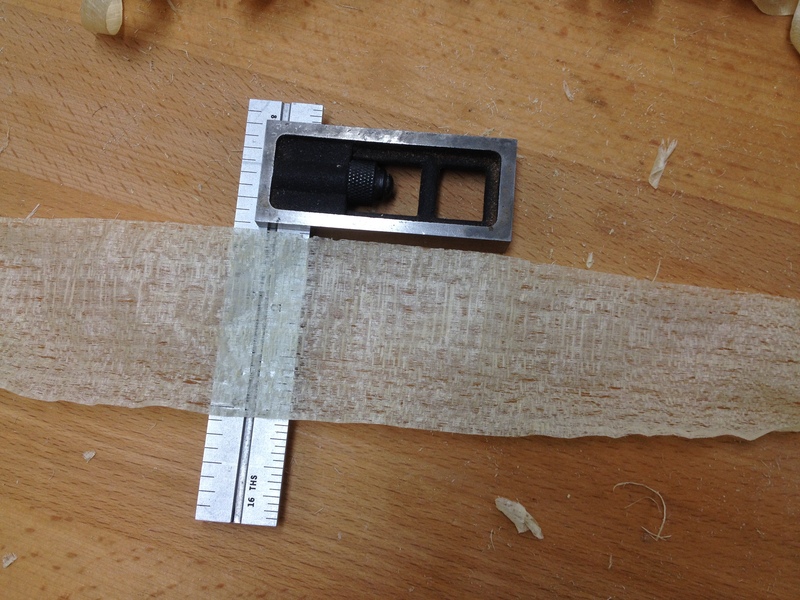 Sometimes I struggle with keeping my rebate plane cuts square, so I have to fix them with the rabbeting block plane. But I tried some hand and body position adjustments last night and it seemed to work. These rebates were MUCH better; practically square, even! Does anyone else ever feel guilty just putting shavings like these in the shaving bin? They look so… cool! 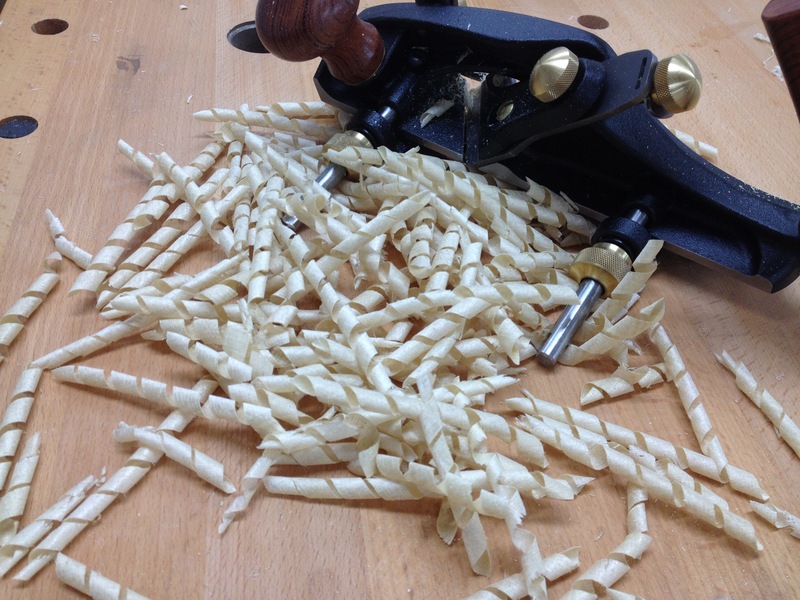 They aren’t like your average shavings. I feel like there is something I should be able to do with these wonderful curls of wood! Let me know if you’ve figured out a way to use them, yah? Look at that lovely quartersawn grain! Now that I have the box proper all set up, I can work on fitting out the inside and maybe tighten up the miters a little. I have some interesting ideas for it that I’m excited to try out! And, if I have enough time, I might try and do a little inlay, either on the front or on the lid. I picked up a box of pure white holly scraps from Bill Rittner, left over from the holly knob and tote I bought from him, and I’ve been dying to try carving some of it up! Or maybe try something else? Not sure yet. ← Don’t Forget To Make Stuff! You take those shavings and toss them in your fireplace, then add a couple of logs, and light the shavings to get the fire started. It even works if you’ve got a gas source. Lovely! I’ve had some luck with home center poplar. And the Depot sometimes has very nice pine depending on what day of the week you are there. Otherwise, it’s like a game of Marco Polo. BTW, is that the Veritas “moving fillister”? I had come very close to purchasing that plane but ended up with an ancient one. I love it, but it took me forever to get it up and running. What is your opinion of it? I may still purchase it one of these days. Thanks. It is, Bill. “Rebate” is faster to type. 🙂 (not that I’m REALLY so lazy that I can’t type “moving fillister”, even on an iPad without my Bluetooth keyboard). I have an old wooden one, as well. I have trouble getting it to work, to the point where I used some LV gift cards and some of my own money to pick this one up. 100 times better, especially now that I think I’ve figured out my problem with trying to keep the fence square. I think adding an auxiliary fence will help that. 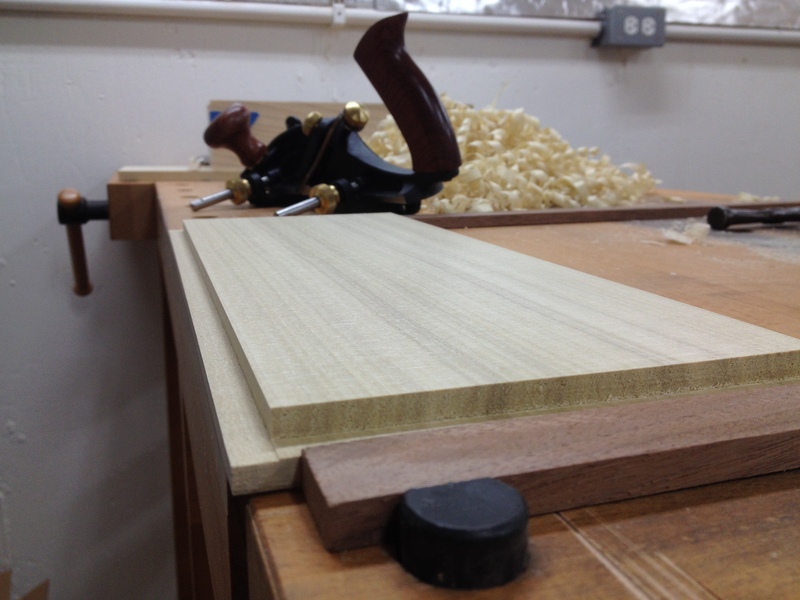 I also try to line the work piece up with the side of the bench so the bench gives me more to register against. It is easy to set up. Easy to sharpen. Easy to adjust. I don’t use the left hand knob; I press my fingers against the front part of the fence; it helps me stay square. My only negative is really my own fault; I nick myself on the other end of the blade, the left side that isn’t engaging the wood, about every other time I use it. That sucker is sharp AND pointy. But I just need to handle it better. At least it is always a clean cut! I’d highly recommend it, especially if you don’t have a TS to cut rabbets. The moving fillister has slowly but sure become my favorite plane. I think it’s invaluable for any woodworker that likes “casework”. I’ll always be a table saw guy, but it’s so much easier to set the fillister to whichever width and depth you like and go to town. The Veritas version will definitely be my next hand plane purchase.